'Oru Kaattil Oru Paykappal' is a love story,written and directed by Vijayakumar Prabhakaran.. But the love and the story only seem to unfurl in a decidedly slow pace. However, the director seems to know his way around telling a story. He tries to keep it realistic and minimalistic, without the embellishments of dramatics. The movie tries to capture the essence and beauty of the landscape in the backdrop of a love story. Sara, an Anglo-Indian in Alappuzha, helps her mother run Freddy's Paradise, the family owned homestay where they host tourists. Ajith, an ex-mariner rents out their facility to build a boat of his own. In the meanwhile, Sara is riddled by a recurring dream of flying sailboat. And as the interval approaches Sara's dream is getting distinct. But what it means, is still a mystery. The characters have a certain lightness to them and yet still are multi-layered. The visuals are breathtakingly beautiful and have a subtle storytelling quality. Bijibal's music- both the background score and the songs- are in sync with the narrative. 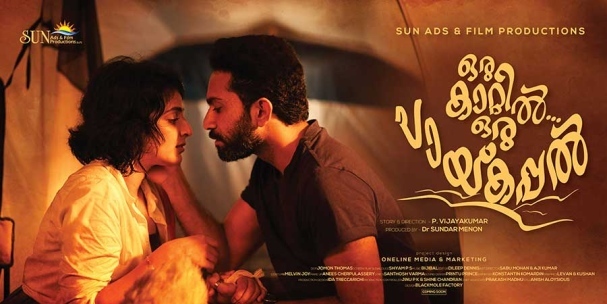 Verdict : Taking its own sweet time, 'Oru Kaattil Oru Paykappal' is pleasing to watch., a slow paced love story.